The central spire collapsed as of about 5 minutes ago. Does France not possess air tankers or helicopters with buckets? I can only assume they fear causing further damage with drops but... c'mon, man - you're losing the whole thing at this point. The Cathedral was started in 1160 - almost 1000 years with no major fires, and our modern world can't even put one out. What a friggin' disgrace. I've been following it on Twitter since it started... I'm honestly really heartbroken by this. So much history just burning to ashes and I still don't see a single hose on it yet. Yes, it's just horrible. I imagine that the stone walls have served as a kind of crude oven. The interior must be a complete catastrophe, with even metals melted. I'm Jewish and this tragedy goes to my heart. What!? How bad is it!? That’s a very famous place, and a wonderful piece of architecture. Looks really bad and day after palm sunday when so many people were probably there. Certainly hope it was an accident. Many old buildings, especially churches, are fire traps. A large church up the road from my home was struck by lightning a few years back and burned to the ground. The FD responded in minutes but could not save it b/c it had never been retrofitted with the proper sprinkler systems. It took a full forty five minutes (at least) before the first fire truck with a ladder high enough to reach the roof arrived on the scene. Honest question: what were the Parisian fire services doing? There isn't a chance in the world that a similar fire in NYC or Boston or whatever wouldn't be completely under attack within 10 minutes (or much less) - every outfit in the city would be flying towards it. Yet I watched the thing burn without any significant counterattack for the better part of an hour. For the air tankers - it's damned if they do, damned if they don't. Why? the materials the cathedral was built with, water would wash away and cause further damage. On top of that, having planes drop heavy water on an already weakened structure could collapse it all. It may be better to have it just burn and attempt to save the rest. I hate to say this. Nergy the so get over it part of the comment was unwarrented. I am an agnostic myself but I recognize the importance of this cathedral to so many people, 13 million visitors a year. I,m sad that one of the most significant buildings in the world is possibly going to be gone. This is terrible I just learned about this!!! Oh my word!! Wow!!! How many centuries has this been standing?? Everything we humans built will go that way, eventually, so get over it. Tasteless. If you cannot appreciate history, what the heck are you doing on the forums for a game that celebrates it? Over 8. It was begun in 1160, and completed in 1260. To put that in perspective, this was hundreds of years before fully plate-armored knights were even a thing. Man, that's horrible. Such a loss of history. It takes hours to get one of those tankers loaded and in the air. In addition, you have a fire encased on the underside by stone vaults and on the top side by a lead roof. There's no way to get the water in. 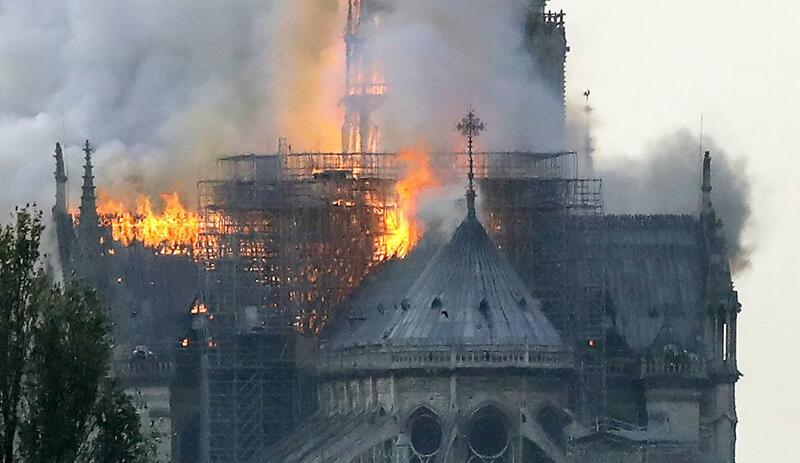 Considering how the central tower/dome and roof where being restored and under construction, i'm guessing it might have been an electrical fire from the equipment being used. Regardless, as a history buff this is definitely a blow to human history as a whole, hope it gets resolved soon so it doesnt spread to the surrounding buildings, or even worse, the bell towers. Yeah NYC Firefighters are pretty awesome, because they have needed to be. I am shocked over the French taking so long to respond over a world heritage sight. The cathedral was 500 years old before the US even existed. It's because they haven't needed a ladder truck that high til now in any of the surrounding area. The city code prevents buildings from being taller than Notre Dame Cathedral for miles and miles around, so they didn't have trucks anywhere near there that could cope. Really the only way to prevent this was to install a sprinkler system in the attic spaces. Yeah or even fire fighting boats since they are near the river. Word is though they have managed to pull at least some of the art and artifacts out of the cathedral in time. And no people are hurt so far at least. This was a HUGE symbol... I wonder if it was arson.